The you’ll love Funicular Productions – The Murder Express. Join the train conductor on The Murder Express and embark on a journey of a lifetime. Travelling by train from Pedley Street Station guests will enjoy pre-drinks at the Seven Sins platform bar before boarding. Then once on-board will be served a selection of dishes creatively crafted by BBC One’s MasterChef’s finalists. Some community members of Love Pop Ups London had the opportunity to sit back and relax whilst enjoy the beautiful scenery along the way. I didn’t know what to expect when i arrived but the building had a train station appearance. We assembled at the bar, perusing the cocktail menu. I decided on the loco motive which was excellent. The actors mingled amongst us interacting with us in character. We boarded the train and was greeted by the conductor. The table was nicely decorated and i loved the embossed good quality napkins as it gave it a real steam engine dining experience. We started off with the mulligatawny soup served with a cucumber canape, a perfect 1920s starter. The main course of les olive de boeuf was tender and perfectly cooked served with a beef stuffed savoy cabbage. The deconstructed apple crumble was lovely and finished off with a brandy snap. The actual show was entertaining and they included the audience which was a nice touch. I won’t ruin the ending by telling you the killer thats for you to find out. Love murder mystery and quality Masterchef food then you’ll love Funicular Productions: The Murder Express. I jump on board the Murder Express, for an immersive dining experience that blew my mind. 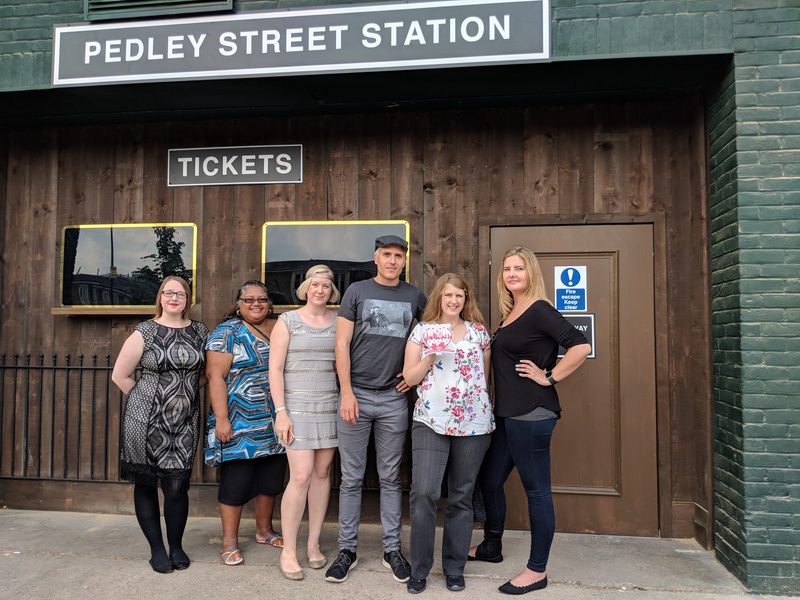 Pedley Street Station has recently opened and launched its new luxury train ‘The Murdér Express’, where you can enjoy a wonder 3-course meal with the entertainment of a murder mystery. Thanks to Love Pop Ups London I got to go on a ride of a lifetime. I’ve been to a few murder mysteries in the past and have had a mixed opinion of them. I love the idea of dinner and food obviously, but the stories have been too complex and complicated. I love a good mystery, but I’m out to have a fun night out as well, not do intense investigative work. Thankfully, this experience was exactly the perfect balance of things, and was actually a lot of fun. When there’s never been a murder on The Murdèr Express you know you’re in safe hands…. rights? !